Environmental Protection Agency Administrator Scott Pruitt is recusing himself from a number of active lawsuits against the EPA he pursued as Oklahoma's attorney general— including the Clean Power Plan and Waters of the United States suits, according to a memo environmental and energy publication E&E News obtained under a Freedom of Information Act request. 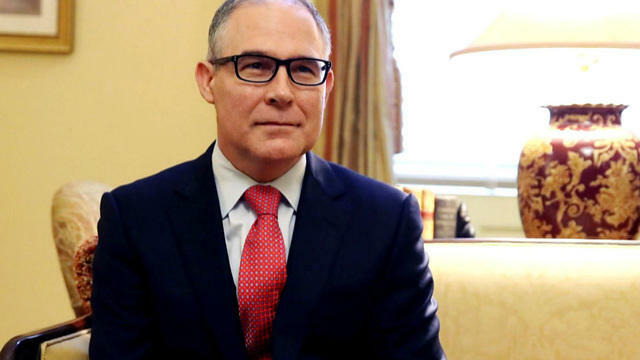 "To demonstrate my profound commitment to carrying out my ethical responsibilities, while I am the administrator of the United States Environmental Protection Agency, I will not participate in any active cases in which Oklahoma is a party, petitioner or intervenor, including the following," Pruitt wrote in the May 4 memo to EPA's acting assistant administrators, acting general counsel, inspector general and acting regional administrators, before listing 12 cases from which he is recusing himself. Pruitt, a longtime critic of the EPA while serving as Oklahoma's attorney general, joined a collection of attorneys general suing the EPA over the Clean Power Plan, the key component of former President Barack Obama's climate change agenda. Last week, a federal appeals court granted President Donald Trump's request to halt the lawsuit, effectively sending the rule back to the EPA for review and likely quashing the measure that aimed to combat carbon dioxide emissions from coal power plants. Pruitt also sued the EPA in 2015 over the Waters of the United States, or "WOTUS," rule, which expanded the definition of what qualifies as a federal body of water. But Mr. Trump signed an executive order in February directing the EPA and the U.S. Army Corps of Engineers to review and rescind the rule. Pruitt's memo also recuses him from litigation involving Volkswagen, including the criminal case against the company for allegedly cheating on emissions tests. "Thus far, I have not participated in any of the cases listed in this recusal statement officially at all and will continue to recuse for now," Pruitt wrote. "In the event that I wish to participate, I will seek an ethics determination from the (designated agency ethics officer), which will appeal the federal partiality set forth" in federal law.